Early November, most of the cities are switching on their Christmas lights. Its also the time to start thinking about your Christmas decorations – especially if you want to make them extra special this year and add a personalised touch! Every year most of us recycle our garlands, lights and baubles but for those who are a little bit bored with seeing the same decorations year after year, why not add a few new things? It doesn’t need to expensive and it can be a lovely project to have with your kids, building up the excitement prior to the festive season. If you are planning to make doorstops, cushion covers or other sewing projects to decorate your house for Christmas, we know it can be difficult to find unique Christmas fabric patterns. 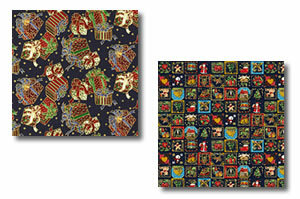 Below are some fantastic Christmas fabric from myfabrics.co.uk. We have only selected our favourite fabric patterns, to see the full range please click here.